Don't even think about driving along the eastern lakefront this Sunday. 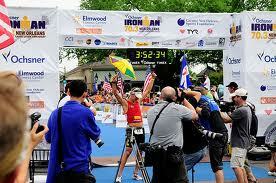 It's race day – IronMan New Orleans 2012 (and one of my favorite days of the year). Thousands of athletes will be pounding out to Venetian Isles from UNO's lakefront campus. All morning, cyclists will be heading out and back via Hayne Boulevard, Paris Road and Chef Menteur Highway. The race directors and City Hall have figured out how to keep the streets open (for the most part), but keep your heads up for slowdowns around the area. The run course meanders around Lakeshore Drive, Wisner Boulevard and City Park, so try to avoid Robert E. Lee Boulevard if at all possible – but if you do get stuck, you might be able to scope out the Blue Angels airshow that's also running on Sunday. The finish is no longer at Jackson Square, so you shouldn't have any issues in Mid-City or downtown. It's too late to register for the race, but if you'd like to volunteer, you can do so at the race's website (you can also check out the full course maps there). It's a fun and easy way to experience long-course racing without the pesky necessity of propelling yourself 70.3 miles. If you want to bang out a slightly shorter race, the 5k Nicole Murphy Tiger Run starts at 8 a.m. at Shelter 10 in Audubon Park; proceeds benefit the student-run homeless clinics of the LSU School of Medicine. Stragglers will have to navigate around Teaching Responsible Earth Education (TREE)'s Earth Day Earthwalk, which starts at 9 a.m., also in Audubon Park.